While it isn't the most exciting Strat we've ever seen, this Professional model lives up to its name. Top-notch build quality. Superb, 'produced' Strat tones. There are nine guitars in the new guitar range: Strat, Tele, Strat HH, Strat HSS, Telecaster Deluxe, Jazzmaster and Jaguar, plus Strat and Tele lefties. But while the name is new, there's plenty here that's inherited from the Standard platform, such as the flattened 241mm (9.5-inch) fingerboard radius and the two-post vibratos. The Professionals - just like the Standards before them - are designed to appeal to a wide range of players with a wide range of styles. The major difference between these new styles, however, is the new single-coil pickups. Now, we've already covered Tim Shaw's Shawbucker-equipped American Standards, but it's the single coils that Tim has concentrated on for this collection. The basic premise lies in using different rod magnets for the treble and bass sides of the pickups from a choice of Alnico 2, 3 and 5. All the Strat pickups use 42 gauge Formvar wire and are calibrated for their positions, plus the centre pickup is RWRP so the parallel mixes are hum-cancelling. Another change we see for this year is a slightly tweaked control circuit, in that the volume uses a treble bleed capacitor and resistor (an RC network) on the volume control to retain the high-end as you turn your volume down. The new neck shape here isn't hugely different from the ubiquitous modern 'C' of the previous Standards; it's marginally deeper back- to-front with a subtly fuller shoulder. That said, the new Strats are all slightly different, and more so the bigger-feeling Telecaster. But it's not just about the feel, as Tim explains: "Beefing up the neck as it goes into the body - taking it back to the way they had been - stiffens the neck and basically gives us a little more sustain and allows the high strings to ring a little better." All the Professional models are shipped with 0.009s, again reflecting their mainstream target along with a pretty low and slinky action. The new wire measures 2.35mm wide and approximately 1.3mm high, which seems slightly narrower but a little taller than Dunlop's 6105 spec - making bends, hammer-ons and pull-offs really easy. Another subtle plus-point. To some more vintage-y players, there might be a lack of character to be found here. To most of us, however, the Pros feel like very fit-for-purpose tools - get on and play. It's the same deal with the vibrato. Yes, the string spacing is slightly narrower-than-vintage, but it's extremely smooth with approximately a tone upbend on the high E, a minor 3rd on the G, and more than enough down-bend for most. The new arm just pushes in (there's a small screw at the back of the block to set the swing tension), and straight out of the box it offers pretty spot-on tuning stability. Plugging in a couple of reference Strats before the new Pro Strat, the latter sounds immediately brighter and spankier, cleaner than the rougher, tougher voice of our Custom Shop Texas Special-equipped original '60s Road Worn. 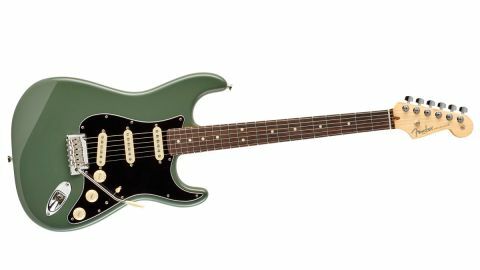 Slightly raising the pickups and reducing the bass-side tilt a little does warm things up, but here's a modern, clean-voiced Strat that almost sounds like it's been 'produced' to maximise its Strat-i-ness. Where are you going to take it? We find ourselves driving in a slightly different way, pulling back the tones a little to lose some of that edge for rougher tones, while the treble bleed cap keeps things bright as we knock back the volume and hit the pop/funk button. The Strat with ash body is only available in Sienna Sunburst; likewise the HSS, both have either maple or rosewood 'boards. It's alder-only on the HH, while the Tele, as you'd expect, has an ash body on Natural, Crimson Red (rosewood) and Natural 2-Colour Sunburst, Butterscotch Blonde and Mystic Seafoam (maple). The alder choices are wider on the Strats with 3-Colour Sunburst, Olympic White, Black, Sonic Gray and Antique Olive (all with either maple or rosewood 'boards). The alder HSS comes in 3-Colour Sunburst, Black, Sonic Gray and Antique Olive (rosewood), with a maple-'board Olympic White replacing Sonic Gray. The HH is only offered with rosewood fingerboard in 3-Colour Sunburst, Olympic White, Black, Sonic Gray and Antique Olive. Yes, we've played thicker, beefier-sounding Strats, and thinner, brighter ones, too, but as a foundation tone - which also includes a very smart and practical, lightweight moulded case - it all becomes a bit of a no-brainer.